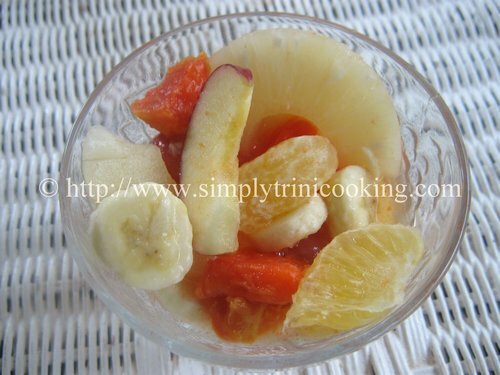 A Fruit salad is a marvelous way to get your regular serving of fruits for the day in a delectable way. 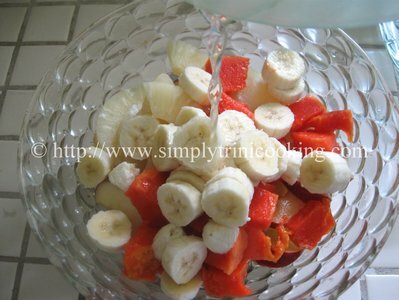 Also, kids tend to eat more a variety of fruits when it is served this way. 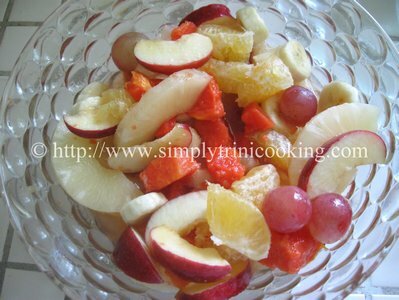 You can make a this salad out of a variety of your favorite fruits. But what makes a fruit salad so special? 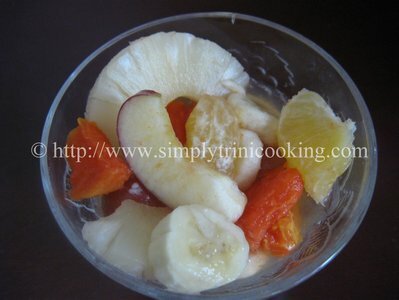 Fruit salads are composed of fresh wholesome fruits. These fruits are just what the body needs to get its daily antioxidants. 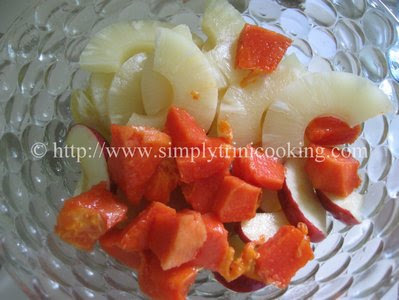 It is quick, easy to prepare, and require no cooking. 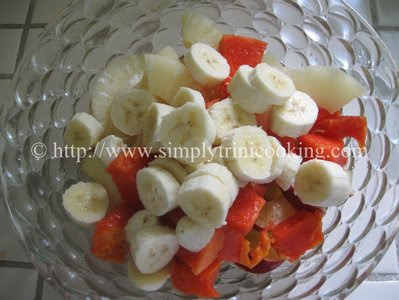 Best of all fruit salads can be low in cholesterol and calories. Also, fruit salads are filling to the point I think less of eating fried fattening commercial snacks. So it is perfect for those trying to lose weight. I know my (fruit) salad is not entirely tropical with the grapes and all, but I kind of settled for what was available at the fruit stall not far from my home. This is also, the reason I ended up buying a tin of pineapple in a light syrup. I bought a large Julie mango, but when I got home I noticed that the fruit stall vendor had forgotten to pack my mango in the bag. You could only imagine my disappointment. Nevertheless, I still had enough fruits to call it a “fruit salad”. In the end the fruit salad was tasty and quite filling. Though, it would have been much better if it really had that Julie mango)! Enjoy a tasty Fruit Salad. 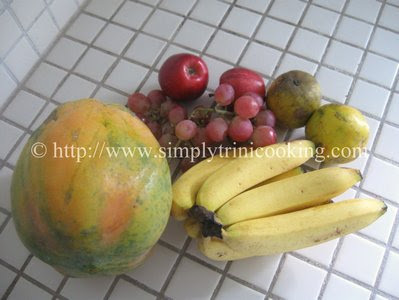 Here are some of the fruits for the fruit salad. Peel the orange and remove the seeds. Wash the grapes. 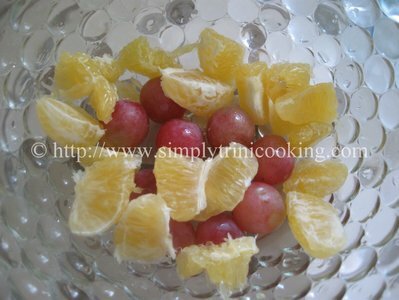 Place in a deep glass bowl or your favourite fruit salad bowl. 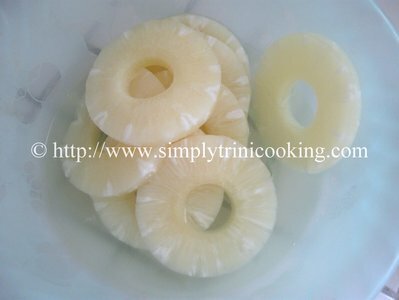 Separate the pineapple slices from the light syrup. Set aside the light syrup. Cut the pineapple slices in half or to your liking. Add to the fruit bowl. 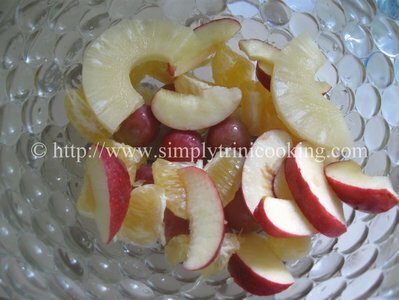 Wash and cut the apple in thin slices. Peel and dice the pawpaw into 2 inch pieces. Peel and dice the banana. Pour the light syrup from the pineapple over all the ingredients, and toss slightly. Note: If you use fresh pineapple, you will have to make your own light syrup. This is easy, just boil together 3/4 cups of white sugar and 2 cups of water until a the thin syrup is formed. Cool the syrup before using. This recipe will yield about 6 servings.